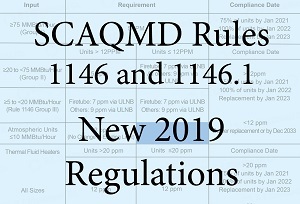 SCAQMD Rule 1146 Printable Table Chart — R.F. MacDonald Co.
New low NOx rules adopted Dec. 7, 2018. The Southern CA Air Quality Management District lowered the amount of NOx emissions allowed for firetube boilers from 9 ppm to 7 ppm. NOx limits remain at 9 ppm for all other commercial and industrial heating equipment. R.F. MacDonald Co. created an easy to read, downloadable compliance chart as a quick reference guide. (3) sulfur plant reaction boilers. Rule 1146.1 applies to boilers, steam generators and process heaters that are greater than 2 million Btu per hour and less than 5 million Btu per hour rated heat input capacity used in any industrial, institutional or commercial operation with the exception of RECLAIM facilities (NOx emissions only). Source: AQMD Rules and PDF of Rule 1146 Amendments.